Type RG electric heaters are designed to heat hand rollers and stitcher tools for certain operations in the production of tires, rubber, composite, and plastic products. Most models are thermostatically controlled. Heater construction is designed for side mounting. Heaters can be modified for upright operation. 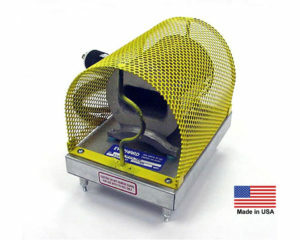 Type RG heaters include a metal safety guard to prevent accidental burns during operation. Metal guards are available with or without tool posts. All Type RG heaters are equipped with a three-wire grounded circuit, with 15-amp, 25-volt twist lock plug.